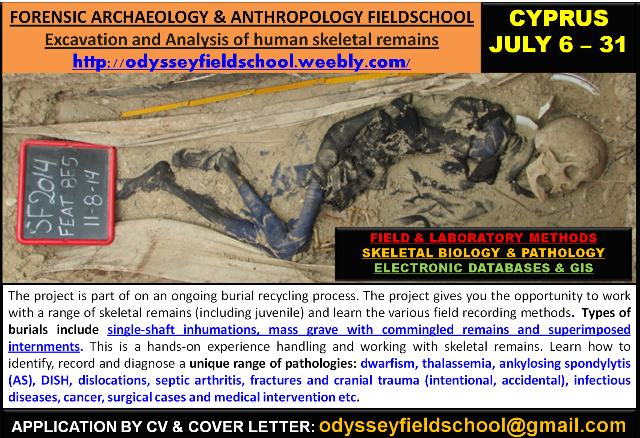 Upcoming Excavation opportunities combined with anthropological analysis of skeletal material. This is a practical experience in the excavation and post-excavation analysis of skeletons from a modern cemetery. The project aims in the recovery and analysis of individuals from modern burials exhumed during a process of recycling of old burials. The burials are dated between 1999-2010 and the remains will either be repatriated to the families or stored in the approved ossuary facilities of the island depending on the related requirements. The process of recycling burials aims in the provision of space for new temporary internment to take place when necessary. This is a socially and culturally sensitive environment with all ethical parameters followed in every step of the way. Each individual exhumed is treated following scientific standards adhering to the existing SOP policies, locally and internationally. In addition to the excavation, the students will work with The CYPRUS REFERENCE RESEARCH COLLECTION (CRRC) which consists of 2000 skeletons dated between 1970-2010 and there is an on-going process of cleaning, recording (in electronic databases) and analyzing for developing biometric standards of the population, defining biological affinities and understanding demographic population shifts in the Greek Cypriots. The fieldschool offers the students an in-depth and completely hands-on experience in working with human skeletal remains. 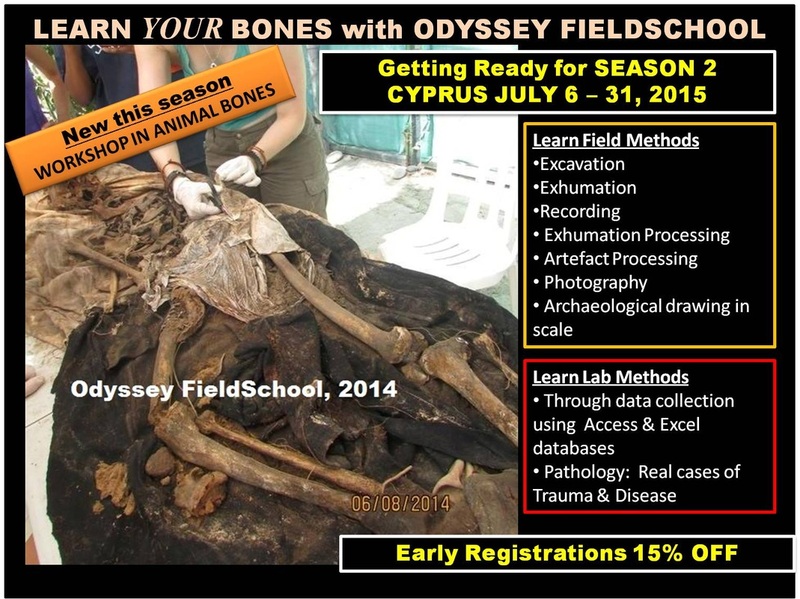 This course is designed to give anthropology and archaeology students an appreciation of the dynamic nature of the human skeletal system and the applications of human osteology in forensic science and bioarchaeology. A hands-on approach to learning skeletal biology is emphasized. The students will also participate in the excavation and post-excavation analyses while they will be trained in field recording and recovery methods applicable to forensic and archaeological contexts. Through this process the students learn all there is to learn about human remains and gain a hands-on experience regarding every aspect of dealing with skeletons. There would be long days working in the field and lab but also more relaxed days working in the analysis of human remains from the collection. The students get to work with various types of remains, including some being commingled and juvenile skeletons. There is a lot of interesting pathology, including trauma, evidence of surgical intervention, congenital disorders (e.g. dwarfism), degenerative conditions, cancer and more. Skeletal analysis of skeletons from the CRRC will be part of the project, thus giving the students the opportunity to participate and engage in all of the recording and identification processes as well as methods of the on-going research projects. Enjoy a month of learning in the idyllic island of Cyprus where you can enjoy everything from culture, adventure and a fun nightlife.